Size Range : 0.15 to 8.50 MM Dia. Packing : Coils -Carriers -Drums -Spools as per Din Standard. Seaworthy Export Packing wrapped with plastic film or Jute cloth or packed in corrugated boxes. 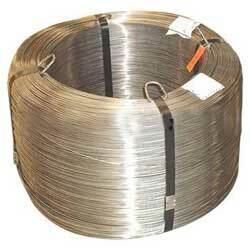 Usage : Braiding Weaving, Spring Wires,Conveyor Belt, Filters, Nail wire, Screws, Cold Heading, Wall Tie/ Tying Wires / Re-inforcement Bars, Filler Wire (Tig & Mig), Welding Electrodes, Rope Wires, Knitting, Kitchen wares, Ornaments, Scrubber, Mesh, Hoses, Fencing etc.